DM Packaging was founded in 1997 by Don Mitchell. 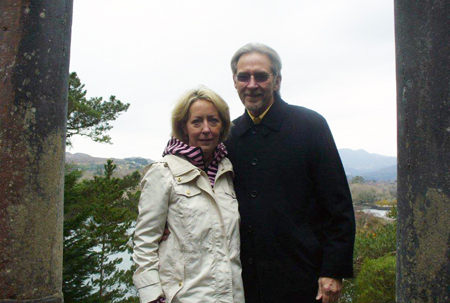 Prior to starting DM Packaging, Don had a very successful 17-year career with Duro Bag Company. While he achieved success and all the goals he set for himself at Duro, he always dreamed of owning his own company. Don's goal for his firm was to align with different companies that could supply all type bags and packaging -- paper, plastic and more -- for all segments of the business world. The growth of DM Packaging was and continues to be a success. The reason for this is simple - the customer's needs are always first and foremost. The firm has held true to its number one goal of being a one-stop shop for all type of bags - plastic, poly and paper. In 2008, Duro Bag called upon Don again to have him help their young sales force and to assist with special projects. After a thorough discussion with his wife, Diann Mitchell, they agreed it would be an opportunity for continued growth and knowledge for both of them. Diann was a Director of Marketing for a major hospitality chain, but she was ready to leave and make a career change herself. So as Don went back to Duro Bag, Diann took over the ownership of DM Packaging and has made a huge impact on the success of DM Packaging since that time. 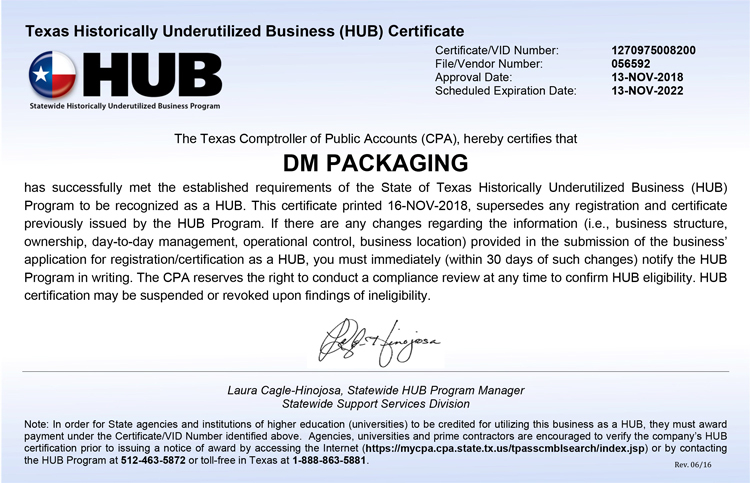 Diann got DM Packaging certified as a HUB (Historically Underutilized Business for the State of Texas ) and as a WBE (Woman owned business for the City of Houston). These opportunities both led to new areas of growth for the company. Don stayed with Duro Bag until November 2011. At that time, he returned to DM Packaging to do what he does best - selling new and exciting products to new and current customers. So DM Packaging remains a true family run business. This has helped the firm maintain the proper perspective that customers always come first. DM Packaging has kept up with the changes in the industry and alerted our customers to important trends and new products, such as switch from non woven bags to safer reusable bags and which cities were about to institute plastic bag bans. Within recent years, DM Packaging has also greatly expanded its industry reach. Once selling only to supermarkets, restaurants/food service providers, convenience stores, and retail outlets, DM Packaging now offers a full spectrum of packaging products for school districts, janitorial service providers, industrial and commercial environments, drug stores & pharmacies, liquor stores, florists, hotels, casinos, and more. Michael Mitchell rejoined the company in 2017 as Vice President of Sales. Michael has 16 years of experience in the paper, plastic and food service industry.